Today, we’re excited to announce an entirely new product, targeted at the broker-dealers and corporate RIAs we work with: Riskalyze Compliance Cloud. Here’s the press announcement from this morning. Auburn, California – Riskalyze, which was named one of the world’s ten most innovative companies in finance by Fast Company Magazine, today announced the launch of a revolutionary new big data platform called Compliance Cloud, designed to help large wealth management institutions sift through their data, spot issues before they become problems, and uphold their compliance obligations. Compliance and supervision teams at broker-dealers and large registered investment advisory (RIA) firms can easily connect the existing account data feeds from their custodians, clearing firms or aggregation providers. Compliance Cloud recalculates the risk across millions of client holdings every night, indexes the results, and delivers a Google-like ability to search the accounts for potential problems. Compliance Cloud helps these firms find accounts with inappropriate investments for their investment objective; with concentrated positions; with high-risk positions; with excessive cash; with periods of inactivity, and more. 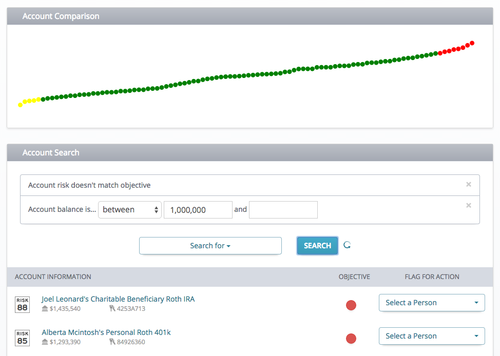 Searches can be sliced by client, advisor, balance, risk level and more. Case management and resolution workflow for compliance and supervision teams is built in. While many broker-dealers and RIAs have successfully adapted to ever-tightening regulations, 2015’s deployment of FINRA’s Comprehensive Automated Risk Data System (“CARDS”) initiative will open a new era of scrutiny that broker-dealers must be prepared for. In addition, the SEC is telling firms of all stripes that they need a risk-based assessment of their accounts to uphold their obligations. Riskalyze also announced Orion Advisor Services as the premier launch partner for Compliance Cloud. Large RIAs who use Orion can seamlessly implement the product with almost zero data feed setup work required. Orion will make Compliance Cloud available directly to its large RIA clients through its extensive nationwide sales team. Compliance Cloud is available to qualified broker-dealer and RIA firms today, and Riskalyze is currently booking new implementations in October. Riskalyze is the company that invented the Risk Number™ and was named as one of the world’s ten most innovative companies in finance by Fast Company Magazine. Riskalyze works with RIAs, hybrid advisors, independent broker-dealers, custodians, clearing firms and asset managers to align the world’s investments with investor risk tolerance. To learn more, visit Riskalyze.com or email sales@riskalyze.com.